Marshal Tyme - Win A Copy! Heroes come in all shapes and sizes, but there’s something to be said for the Marshals of the Old West. He was a man of honor who upheld the law in lawless towns, even if it meant his death. You could count on his stoic personality with barely a smile cracking his lips, and he was always respectful to the ladies – whether saloon girls or schoolmarms. So when my son Marc created Marshal Tyme as a short for the back of his Adam Zero comic books, I fell in love with the character. Here was the tall, slender marshal of the Old West with handle bar moustache, Stetson pulled down low, the weathered duster and completing him; the steadfast, honorable nature. But there’s one thing different about this one. This marshal is in charge of the 1850-1900, American Southwest timeline. His job? Bring justice to travelers journeying out of their time. Think alien robots in the Old West. 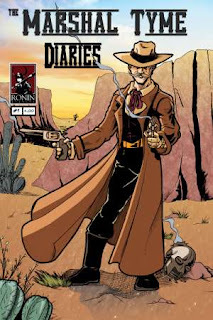 Now to not only my joy, but also for others who fell in love with the old time Marshal, his three stories are available all in one comic, The Marshal Tyme Diaries. If you have kids that like comics or are a fan of them yourself, check out Marshal Tyme. Marshal Tyme is a character you don’t want to miss and to help celebrate this special occasion I’m giving away two autographed Marshal Tyme comics to two lucky winners! To win just leave your e-mail address in the message box or e-mail me at donna@donnafletcher.com and put WIN in the message box. I’ll announce the winner on Sunday. Good luck to all!